Enter the “Anchor” headphone hangar, from Elevation Lab. It’s a hard rubber hangar with “ultra-secure” 3M-branded adhesive. 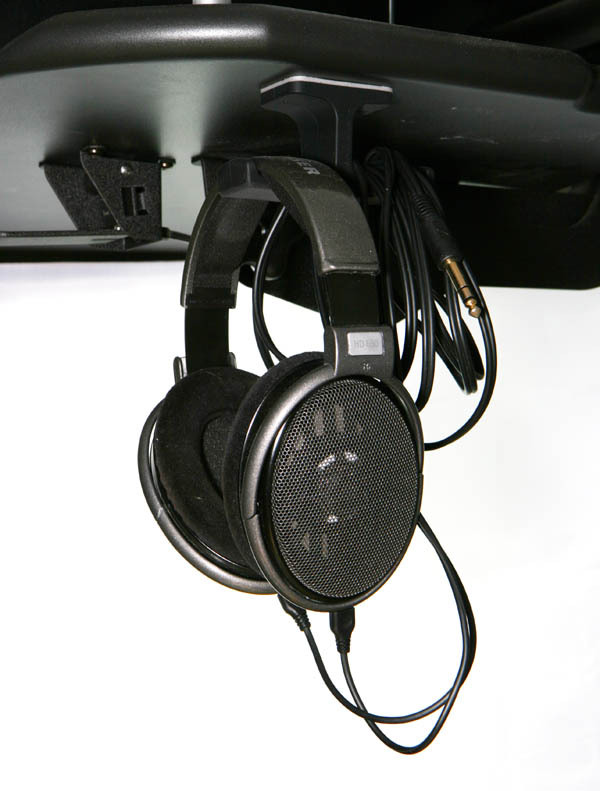 Glue it under your desk: headphone storage problem solved. My Anchor has been hanging since June, and remains very securely mounted. My headphones aren’t getting dusty any more. They’re not getting stepped on. I’m not tripping on the cord. I have the headphones on one wing and the cable on the other, but I think you’d be able to store two pairs of headphones on a single hangar if you wish. Or get a second Anchor. I paid full price for mine, and I’d do it again in a heartbeat. Kudos to Elevation Lab for making something that looks great, feels good, works as advertised, and is cheap enough to merit an impulse buy. Make more cool things for audio people, please. Hi, I had exactly the same problems with my headphones, but didn’t realise they sold hangers for them. My solution was to buy a ladies handbag hanger. It was £1.49 and works a treat.